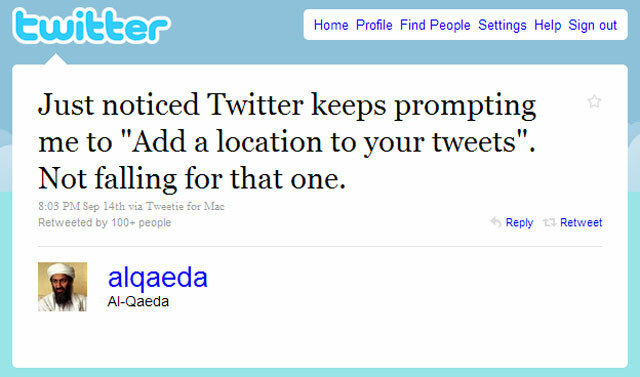 Ah well.. it was worth a try. is what these bins that are all over the UK read. 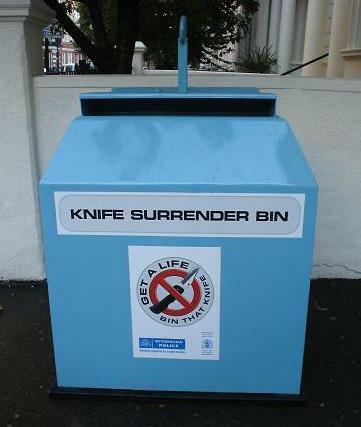 I previously blogged about the knife ban in the UK, but did not know about this initiative. While reading about this today something else came to my attention… apparently “regular” police in the UK do not carry guns! Only “special” units get them. 1) Do criminals actually use these? 2) Do criminals ever break into them to steal knives? 3) What do the police do with all the knives they take in? Melt them down? 4) Why is the bin so big? Even if people are depositing machettes and samari swords it still seems a bit large. 5) What is the ratio of garbage to knives on an average collection day? 6) If you got caught by the police with a knife, could you just claim “I was just on my way to a bin”, or is there some sort of special house to bin transport bag you need in order for that excuse to work? 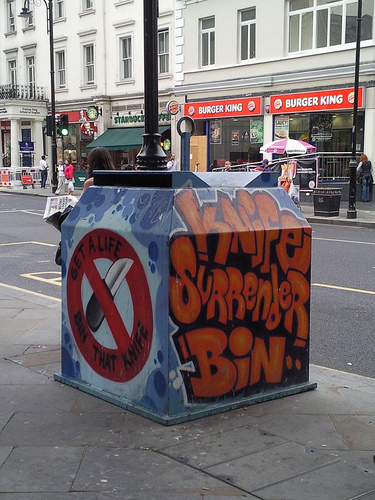 7) How many ironic stabbings / knife heists occur right next to these bins?